In continuation of the year-long celebration of the Japanese screen and scroll paintings of Ito Jakuchu, the Hosomi Museum is hosting the exhibition Celebrating the 300th Anniversary of His Birth Ito Jakuchu a True Kyoto Painter. The Hosomi Museum has traditionally been strong in holding works by Jakuchu and these will be boosted by including a number of paintings from temples in Kyoto. The exhibition is notable, as it provides the opportunity to view some less well-known works by both Jakuchu and his disciples, Jakuen and Kanchu. The first room is dominated by roosters and chickens, with a wonderfully expressive set of twelve paintings on the subject covering the right side wall. Across from the right side wall is one of Jakuchu’s more whimsical ink works: Rooster, hen and horsefly. A welcome and cooling sight on a hot day in Kyoto is Rooster in snow, which is generally accepted as Jakuchu’s oldest known work and one of the few color paintings in the exhibition. The second room shows a number of works by Jakuchu’s most well-known disciple, Jakuen. He is represented by a set of six rooster paintings displayed on a folding screen and two hanging scrolls of the same subject. While Jakuen’s roosters borrow very heavily from the works of Jakuchu, they are still distinct and recognizable. It is also interesting to see a rooster painting by the less well-known disciple Kanchu (the work is on loan from Hozoji temple). It is generally believed that Jakuchu had more followers than are presently known and recognized, and it is fitting to see them gaining greater recognition. Another set of 12 paintings mounted on folding screens show six floral paintings by Jakuchu, matched by six poetic inscriptions by Miyazaki Inpo. Dated at the twilight of his career (1795), as are many of the ink works in the exhibition, the floral paintings are more introspective and reserved than we commonly encounter, and they are almost painted in reverence to Inpo. Jakuchu has even camouflaged his signatures and seals within the paintings. A small color on silk painting of daruma with a singular, lonely seal appeared a touch out of place. It had nothing of the power and drama of the ink daruma in the Gitter-Yelen collection. 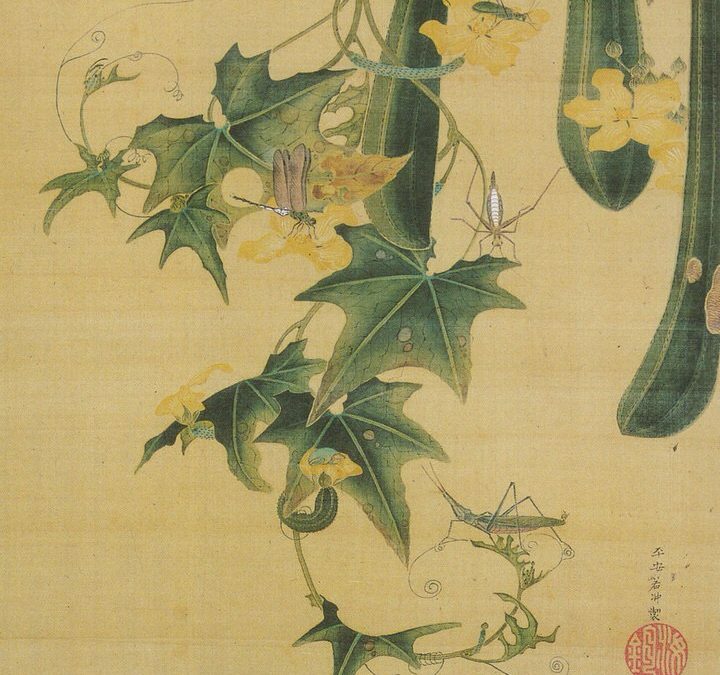 Along with Rooster in Snow, Snake Gourds and Insects is justifiably the most famous Jakuchu work in the Hosomi Collection. In keeping with the meteoric rise of Jakuchu, this painting has been popping up on a variety of merchandise all over Kyoto. Marriage of Mice (1796) is a fitting finale to the exhibition. No Jakuchu exhibition at the Hosomi would be complete without it. The sight of one mouse dragging its partner by the tail in order to transport a ceremonial sake cup is priceless. Traditionally, the mice would be carrying an egg from a laden table and the theme would be the celebration of abundance. The first half of the exhibition is viewable from June 25th through July 31st. The second half of the exhibition is viewable from August 2nd through September 4th.